Note: Axis 01049-021 is a 10-pack of the M2026-LE Mk II IP Camera in white. If you wish to purchase the same camera singly, go to Axis 01049-001. 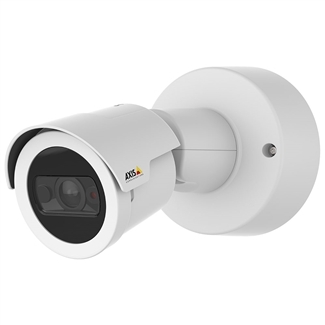 Axis M2026-LE Mk II is a rugged IP camera for outdoor placement with a 4MP sensor for 1440p HD video. M2026-LE Mk II features a built-in infrared illuminator with a 50ft range, giving you video evidence even in complete darkness. The fixed, wide-angle 2.4mm lens has a lens aperture of f/2.2 for bright color video. M2026-LE Mk II supports the highly efficient H.265 (HEVC) video codec, as well as H.264. The camera also supports Axis's advanced technology. Axis Zipstream improves video efficiency while keeping important details. Axis Corridor Format takes vertical video for greatly increase efficiency when surveilling hallways and similar narrow spaces. Axis M2026-LE Mk II is built to last. It's rated IP66 and IK08. All the electronics are securely encapsulated. Its operating temperature range is -22°F to 122°F. Power the camera using an Ethernet cable via PoE. You can store video locally using a microSD card, or through the LAN via network-attached storage. M2026-LE Mk II is ONVIF Profile S and Profile G compliant, so it is interoperable with a broad range of manufacturers' network video surveillance systems.